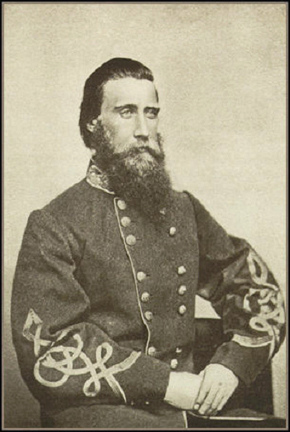 Hood’s explanation for not turning over captured ambulances to Major General Nathan Evans; the refusal resulted in Evans arresting Hood. “…Hood is a good fighter, very industrious on the battlefield, careless off, and I have had no opportunity of judging his action, when the whole responsibility rested upon him. I have a very high opinion of his gallantry, earnestness and zeal. “Hood’s appearance was very striking; in age only 34, he had a personality that would attract attention anywhere. Very tall and somewhat loose-jointed; a long, oval face shaded by yellowish beard, plentiful hair of same color, and voice of great power and compass. With very winning manners, he is said to have used these advantages actively for his own advancement. But apart from that, his services in the field were of the best…As major general he continued to display high qualities and he might be considered an ideal officer of that rank and command. Robert E. Lee never said Hood was “all lion, no fox.” That description of Hood came from Stephen Vincent Benet’s 1929 poem “John Brown’s Body” and has been incorrectly attributed to Lee.